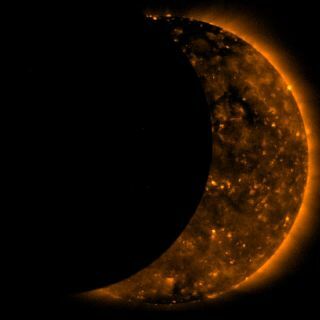 Partial phase of a total solar eclipse, captured by the Hinode spacecraft on July 22, 2009. The word"eclipse" means much more than the vampire and werewolf thriller setto hit theaters on Wednesday. But "The Twilight Saga: Eclipse," thelatest film based on the popular vampire book series, is being released betweentwo of nature's real-life eclipses ? a recent partial lunar eclipse and a solareclipse coming on July 11. The study ofeclipses has been a part of astronomy since its inception, since they are someof nature's most dramatic celestial shows. The first lunareclipse of 2010 occurred on Saturday, June 26, and was visible across parts ofthe Americas, the Pacific Ocean and eastern Asia. However, it was only apartial eclipseof the moon as it passed through part of Earth's shadow. On July 11,the second solar eclipse of 2010 will occur, creating a total eclipse along anarrow corridor of the Earth's southern hemisphere. A lunareclipse, on the other hand, occurs when the moon slips behind the Earth, whichblocks the sun's rays from striking the moon. With a lunar eclipse, the moon,Earth and sun are again aligned (or closely so), with the Earth in the middle. The type andlength of an eclipse depend upon the moon's location relative to its orbitalnodes, which are the points where the moon crosses the sun's apparent path inthe sky, explained NASA solar astronomer Mitzi Adams of the Marshall SpaceFlight Center in Huntsville, Ala.? A lunar eclipse typically lasts for a fewhours, unlike a total solar eclipse, which usually lasts for only a few minutes,she added. The longesttotal solar eclipse lasted about seven minutes, Adams said in a recent NASAwebchat. However, thefirst solar eclipse of 2010 ? the Jan. 15 annularsolar eclipse ? did last longer, but was not total. That annular solareclipse, in which the moon covers only a large portion of the sun, lasted overeight minutes over some parts of Asia. Looking at asolar eclipse through a telescope, however, can be dangerous, Adams said. "Youhave to have a proper filter," she added. "The safest way is througha method called projection, where you actually take the eyepiece out andproject the image onto a sheet of paper behind the telescope, without lookingat the sun. You move the sheet of paper back and forth until you get a focusedimage." While skywatcherscan expect the next solar eclipse on July 11, the next lunar eclipse won't occuruntil Dec. 21. That lunar eclipse should be visible across the U.S., and, whilelunar eclipses can be viewed with a telescope, Adams says that it is notnecessary. "Lookingat a lunar eclipse with a telescope is safe, but you don't really need atelescope ? your eyes are better instruments in this case," Adams said. "One could walk into the back yard to see it, assuming there are noclouds. No telescope is required. Lunar eclipses are best viewed with theunaided eye. However, while the eclipse is going on, you could use a telescopeto look at the craters and mountains on the moon." Adams saidthat while a lunar eclipse should be easily visible anywhere in the night sky,the ideal location would be dark and away from city lights. And all thiscan be seen without the hassle of ticket lines, overpriced popcorn, or any price ofadmission. All you have to do is know when to look up.